In many locations, the villagers had been converted to Christianity and although this bought some advantages for them, it had the sad effect that these particular villagers had completely suppressed or in some cases, lost, their local cultural heritage. 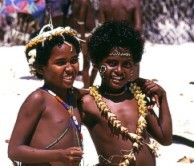 In other locations, especially as we sailed west towards New Guinea, we were privileged to arrive fortuitously on "custom" days: Days when the locals dressed in customary clothing and practiced other customary pursuits. In every instance I found that the nicest aspect was the way the kids treated us. Friendly and accepting in the way most kids are all over the world, these would often row for an hour out to sea to meet us and handled their dugout canoes in the practiced way that kids in the west handle their skateboards. It still shocked me to see youngsters, too young to hgo to school commanding a canoe well out to sea, just for fun. 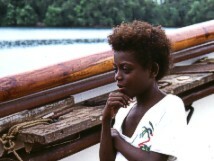 New Guinea. These are tiny atolls no more than a couple of meters out of the water at their highest point. God help them if global warming continues. One of the many beautifully carved examples of local traditional boat making skills. 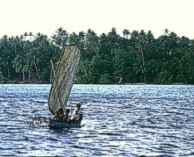 These islands are part of the famous Kula trading rings and canoe making as well as seamanship seems to be in the blood. As usual wherever we went children flocked to see this strange bunch of people and then accepted us with open armed warmth. A local practices his skill at dug-out making.These little fishing canoes are remarkable and it is not unusual for locals to make trips of many days even in tiny examples. A local girl who invited us into her village and her home. 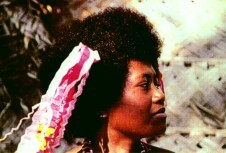 If my memory serves me correct she had her name "Elsie" tatooed on her arm. Many of the locals had great grace and charm. For some reason I have always thought of this young lady as "the Princess" due to her regal carriage. One of the favourite activities of locals was to visit the Eye and just hang out and watch us as we went about our business. Despite the many hundreds who must have come on board during our trips I never heard a complaint about any of our possessions going missing. 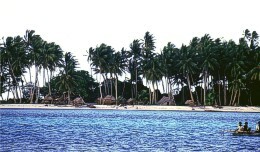 Alcester Island New Guinea. 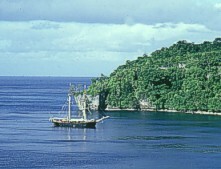 The Eye at anchor off Alcester Island New Guinea. To get this shot I had to climb the cliff face, at one point clambering 20 meters up a ricketty wooden ladder. I thought I was quite adventurous until I noticed that the islanders gardens are at the top of the plateau and even 60 year old women make the trip daily - while carrying the baby or grandchild and their harvest. One of the locals I was not so sure about. 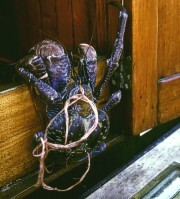 A "Robber" crab - a gigantic beast which looked ferocious and had the well warranted reputation of being able to nip fingers off without even a thought. Incidentally he tasted wonderful. Mboli passage. Someone gave this little cutie I think she was grand-daughter of the "king" some material for a lap lap (a local wrap around dress.) Uninhibited she immediately doffed her old clothing to try it out. This young lady was spotted practicing their custom day by dressing up in customary clothing for a sing sing. 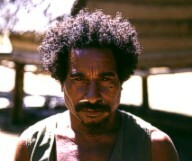 All of the villagers participate in custom day including the young ones. The locals come to visit the Eye under a traditional sail woven from palm fronds. A local village. I don't think I have seen a village as clean and neat as this any where in the world. This little lady is looking very thoughtful. Wherever I could, I enjoyed photographing people who were not posing for the camera as these shots more often conveyed the true character of the people. In most cases the kids were very friendly and pleased to meet us, but just occasionally some looked a little doubtful as we approached, especially if they were not with friends to give them support. In retrospect I could not blame them for being a little worried although on most occasions the response was the opposite. However, I gained an insight into how we could sometimes be perceived on a later visit to Vanuatu, when I was present with a group of divers when we visited a tiny island village near Espiritu Santo. As we approached the village the kids took off; screaming, yelling and running to their mothers. Only then did we realise that most of us were wearing brightly coloured lycra full body coverings designed to protect swimmers and divers from coral cuts etc. They must have thought the village was being invaded by strange sea creatures. I can only imagine what this little guy is thinking. The local kids really were very sweet. Several times children, both boys and girls would shyly take me by the hand and lead me down the path towards the village to meet the elders. They did this not for reward, just for the pleasure of my company. But it was always appreciated if I could give them a little present for their efforts - a pack of gum or sweets always brought huge smiles to their faces and there were never recriminations once I ran out of goodies for them. Negotiating with the locals, "John Wayne's' village" Marovo Lagoon. John Wayne is a villager apparently named due to his parents' admiration for a certain US film star of yesteryear. He and his villagers are renowned for their carving skills which they now exercise for the benefit of tourists. This is one of the few villages where locals wanted money not trade goods. A fine example of a local canoe prow carved in the traditional style. 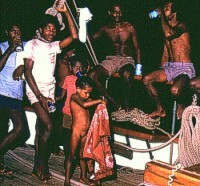 Northern Solomon Islands group. Often the carvings were much more complex but I like the elegant simlicity of this design. The kids regarded us something like western kids might once have regarded members of a circus which had just come to town. They loved nothing more than hanging out, having their photo taken and very often we were mobbed by excited and happy children who were only too pleased to pose for our snapshots or to entertain us with local "custom" songs. A few passengers thought to take small gifts with us - ballons, sweets and the all time favourite; Wriggly's Juicy Fruit chewing gum. This almost always created an explosion of excitement. Here the kids just seem to be enjoying themselves. back Solomons and Guinea page!